We love the cooler temperatures, the color and crunch and smell of the fallen leaves, and the thrill of running in the dark. Sure, night running presents extra challenges, but hey, we’re RUNNERS. It’s what we do. We just have to do it smart. 1. You are invisible in the dark. Be seen. Light yourself up like Clark Griswold’s house – reflective gear, headlamps, glowsticks. If road running, obey all traffic laws and be prepared for the inevitable drivers who cut it a little too close. 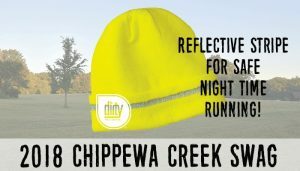 We can even help you out with that reflective gear! 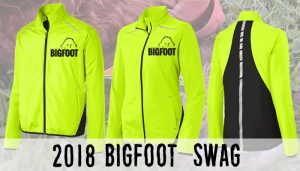 Both Chippewa Creek Challenge 10 Miler (October 20th) and also Bigfoot 50k, 20 and 10 Miler (December 8th) have super cool swag that will help you be seen at night! 2. Leaves hide a lot of stuff. There will be roots, rocks, mud, and poop (gotta love the bridle trails!) under there. Keep those feet up! Run on the flattest part of the path and don’t be afraid to slow your pace. Stuff some extra batteries or a second light source (like knuckle lights) in your pocket. Your smartphone flashlight could do the job in a pinch if you know how to use it. Dress in layers, and be prepared for unpredictable weather to sneak up on you. 6. Trees all look alike. Run trails you know so you don’t get lost. Knowing the obstacles on a familiar route will assure you that you are on course, *might* keep you from tripping over them, and if you are used to seeing that stump in the daytime, you won’t naturally assume that it’s a bear in the nighttime. 7. Everything is scarier in the dark. You will recall details of every horror movie you saw when you were 12. That noise you heard? Yeah, just a bunny. 8. Glowing eyes in the woods will most likely stay in the woods. Depending on where you live, carry bear spray or whatever makes you feel safe, but know that most creatures really don’t want to eat you. 9. Friends make everything better. Run with friends for added safety and visibility, and of course it’s more fun. Try a local running group, like Crooked River Trail Runners – free group runs every Thursday at 6:30 pm in the Cuyahoga Valley. Be seen and be safe — and get out and enjoy all the goodness that night running has to offer!